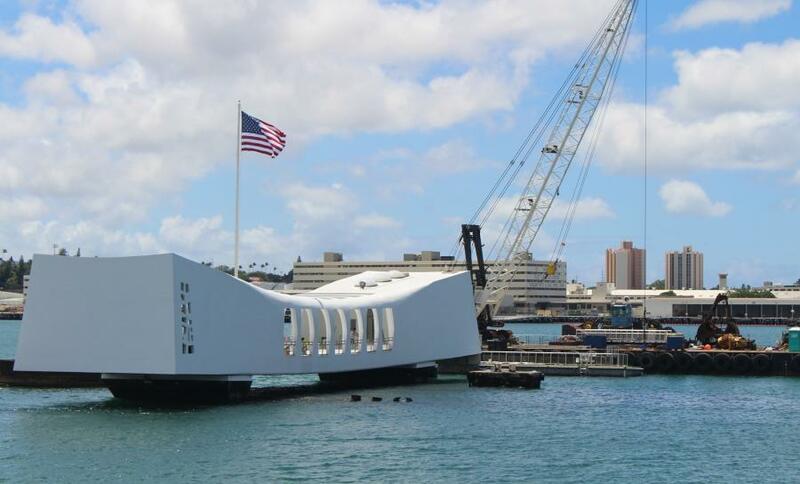 When the USS Arizona Memorial at Pearl Harbor in Honolulu closed back in May, no one knew when it would reopen again. Now, however, the reopening date may be on the horizon. The National Park Service has revised its construction timeline and anticipates project completion by the end of March 2019. "NPS and Navy staff have been working days, nights, and weekends to fix the memorial's dock, and we expect to award a construction contract this year," The National Park Service reported on its website. Due to "critical structural and safety [issues]" to the monument's loading dock and visitor ramp, authorities thought it best to close the memorial, originally built in 1962 over the ship's wreckage, indefinitely in order to do repairs. Cracks that had developed on the outside walls of the monument also complicated the repair process, Travel + Leisure reported. Since May 2018, the NPS and its partners, including the Navy and Department of Defense, dedicated significant resources to investigating the cause of the damage, designing the needed repairs, and streamlining the federal contracting process to being work as fast as possible. This work has resulted in turning what would normally take three to four years, into a seven to eight-month project, The National Park Service reported. The pre-design and design phases are complete. Compliance/permitting is nearly complete. The NPS has completed the equivalent of two years of project work since May 2018. In the meantime, visitors have been able to take a free, narrated boat tour of Pearl Harbor that goes by the sunken ship, as well as other sites including the Battleship Missouri Memorial, USS Bowfin Submarine Museum & Park, and the Pacific Aviation Museum Pearl Harbor.